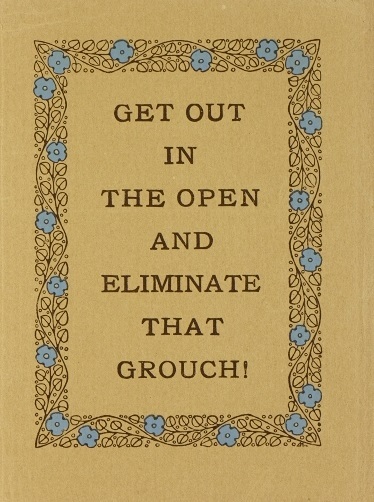 Ninety-seven years ago this Sunday, on August 25th, 1916, President Woodrow Wilson signed into law the National Park Service Organic Act, establishing the National Park Service (NPS) within the U.S. Department of the Interior. Although Yellowstone had been designated a national park in 1876, and Yosemite in 1890, these and other parks had been managed either by independent concessionaires or by the U.S. Army, and were subject to timber, logging, and other unregulated development. President Theodore Roosevelt’s first Chief of the U.S. Forest Service, Gifford Pinchot was a conservationist who championed the prudent use of the nation’s natural resources and opposed efforts in the early 1910s to change the status quo. 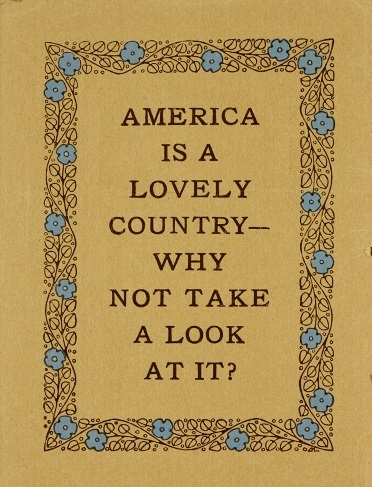 Preservation-minded boosters like naturalist John Muir, Elbert Hubbard, Frederick Law Olmsed, Jr., and groups like the Sierra Club, however, threw their considerable support behind a bill that aimed to place all designated national parks, monuments, battlefields, and historical sites under the auspices of a single federal agency, and thus the National Park Service was born. 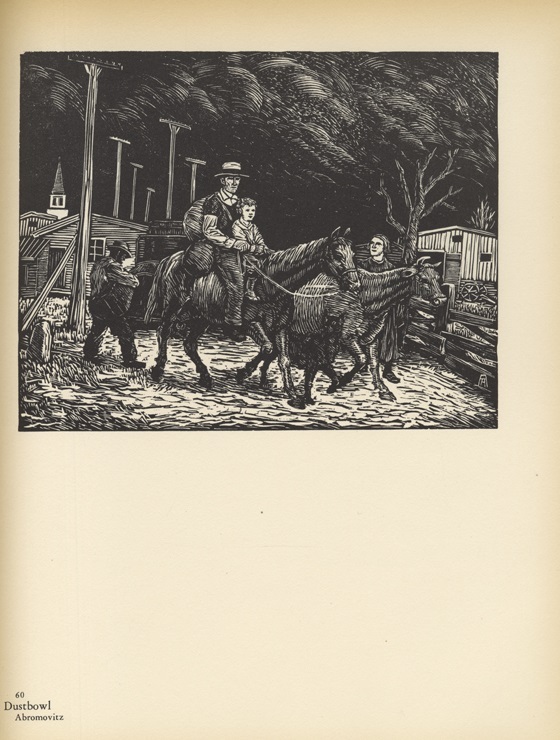 Two years before the establishment of the National Park Service, self-described anarchist and socialist, Elbert Hubbard (1856-1915) and his suffragette wife, Alice Moore Hubbard (1861-1915) took a fourteen day trip through Yellowstone National Park. 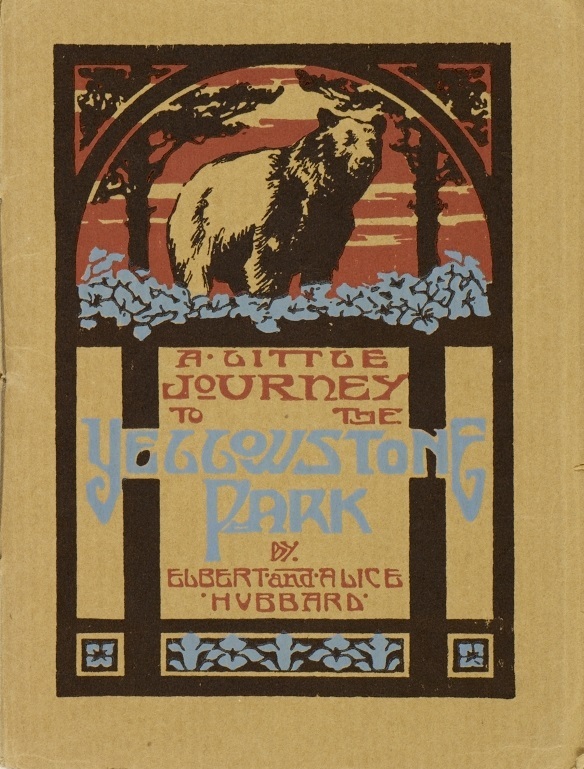 The following year they published A Little Journey to the Yellowstone at their Arts & Crafts movement press, Roycrofters, in East Aurora, New York. That same year, Hubbard and his wife died in the sinking of the R.M.S. 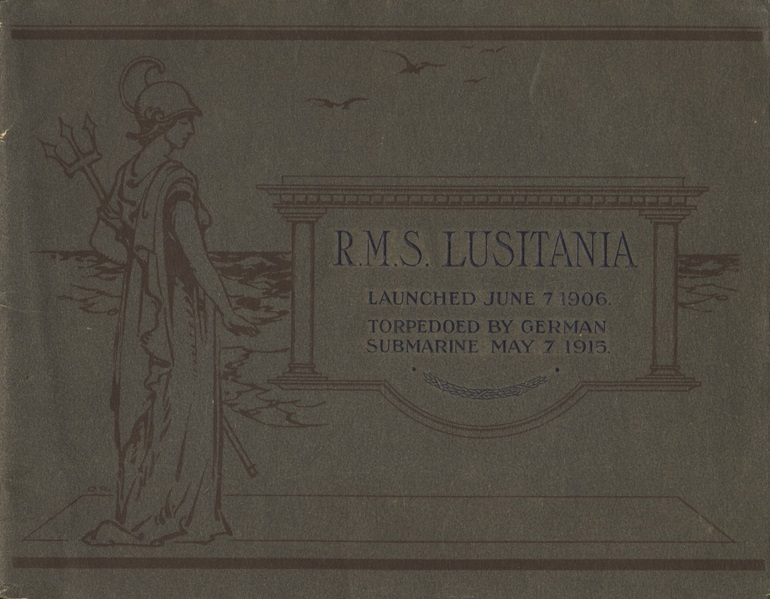 Lusitania by a German U-Boat, and the Roycroft community they had established fell into a slow decline. 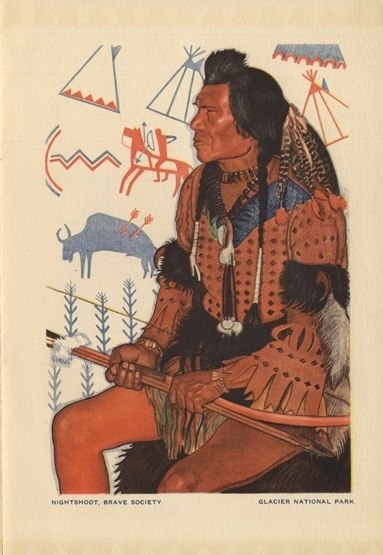 When the U.S. government chose to immortalize a “typical” Western Plains Indian chief on the buffalo nickel, it selected one of Reiss’ subjects. 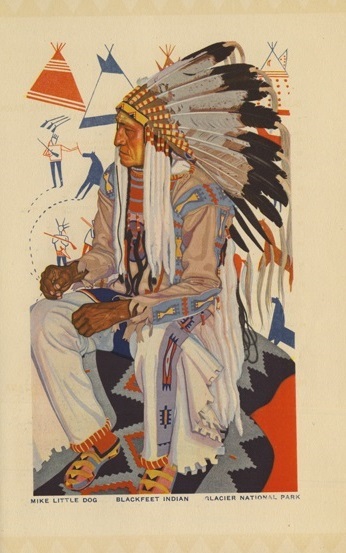 The following decade, the Great Northern Railway used some of Reiss’ “exotic” Native American portraits in a series of commercial calendars to promote the Empire Builder route that passed through Glacier National Park. 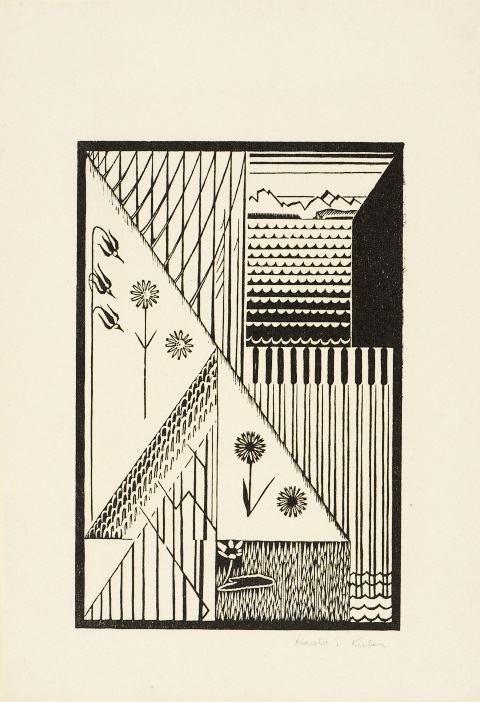 The Wolfsonian-FIU also possesses a wide range of printed paper artifacts related to the National Park Service from the 1930s, including a limited edition book of fourteen prints made from original wood blocks designed and carved by Harold E. Keeler (1905-1968). 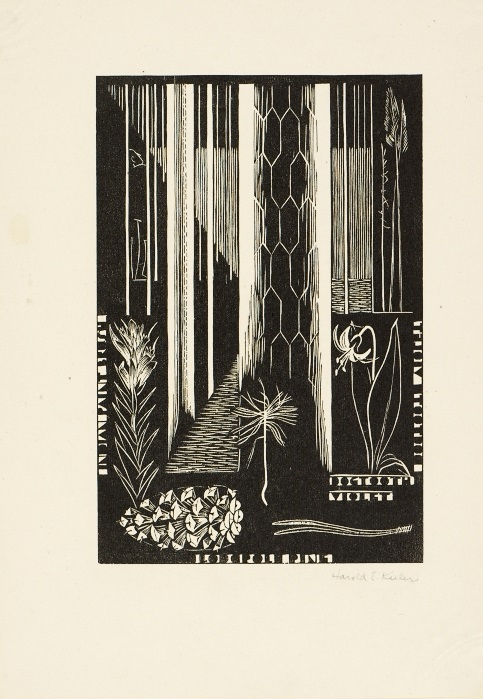 Like the Hubbards, Keeler had also taken a walking tour in Yellowstone and had made numerous sketches of the flora and fauna that he later transformed into woodcuts published in his 1930 portfolio. 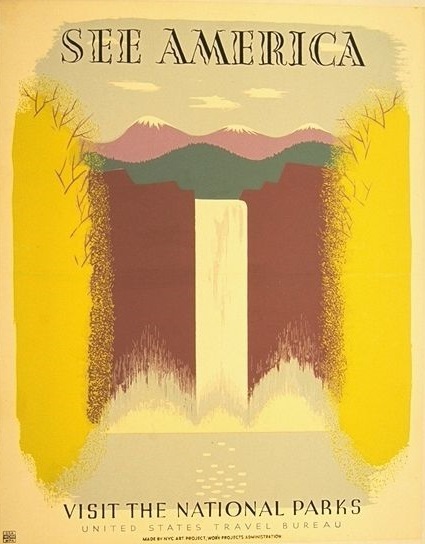 Other national park-inspired artwork in the Wolfsonian collection from the depression-era include posters that were designed to stimulate the economy by providing work to “starving artists” and promoting the domestic tourist trade. 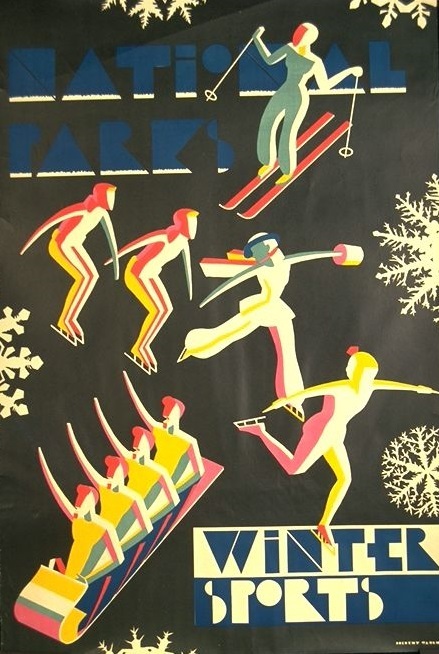 This particular silkscreen poster was designed by Harry Herzog while working for the New York City Art Project, division of the WPA. 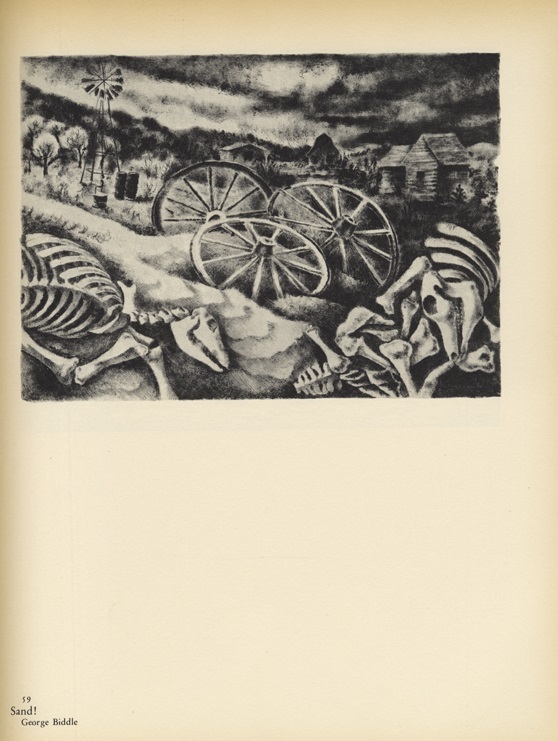 The “See America First” propaganda campaign was no easy sell in the so-called “Dirty Thirties.” Even as commercial artists created idyllic images of the Western parks, more socially conscious artists were drawing attention to the drought, economic depression, foreclosures, and the monster dust storms that forced a quarter of a million “exodusters” out of the Great Plains. 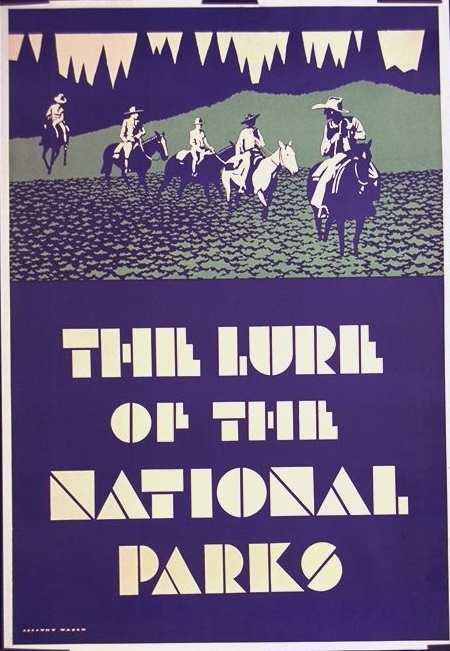 Attempting to paint the great parks of the West in the most positive light, artist Dorothy Waugh created a number of posters promoting the National Parks. 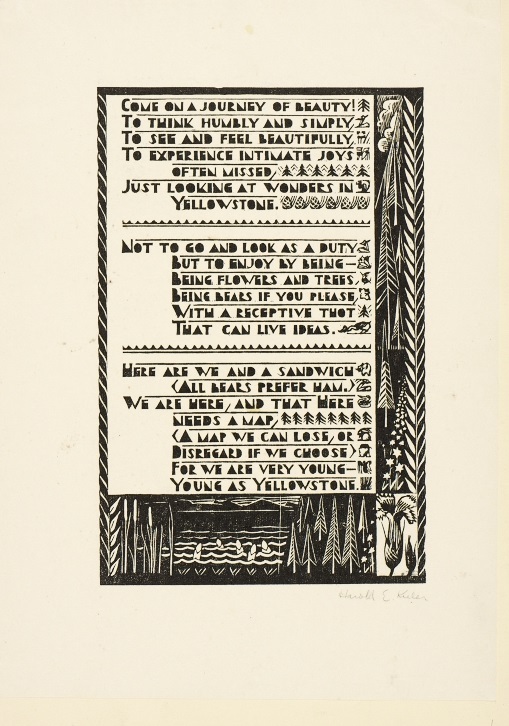 Another couple of WPA posters in the Wolfsonian museum’s Works on Paper Department also aimed to promote the beauty of the parks. 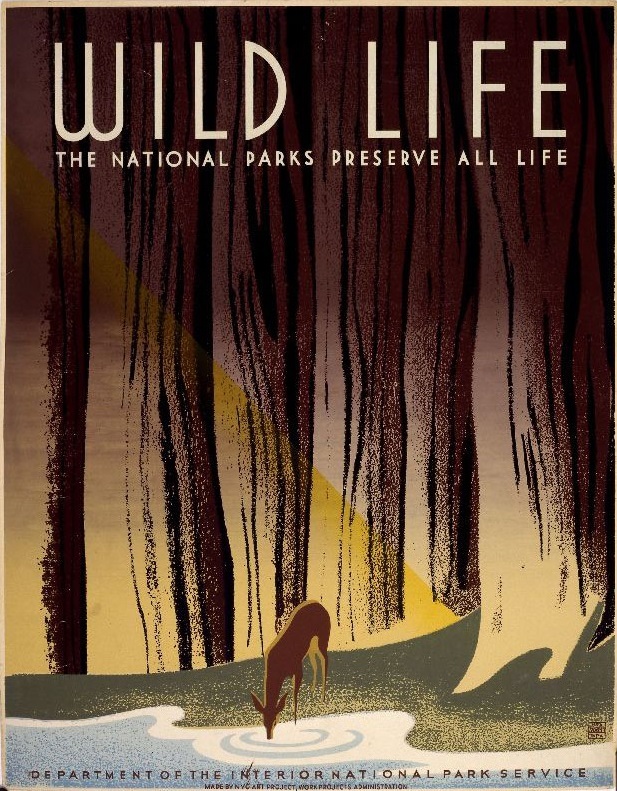 Designed by Frank S. Nicholson (also working for the NYC Art Project), this poster published by the NPS depicts a deer drinking from a pristine stream in front of a wall of tall trees. 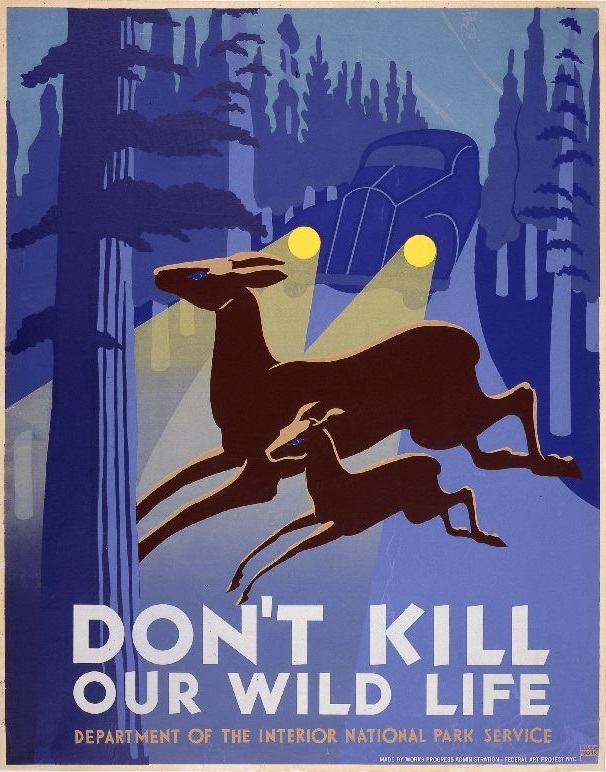 Of course, new roads and increased car traffic in the parks also created the need for park safety posters like this NPS screen print poster designed by John R. Wagner while he too was working for the Federal Art Project, Works Progress Administration. PURCHASED WITH ACQUISITION FUNDS CONTRIBUTED BY MITCHELL WOLFSON, JR. 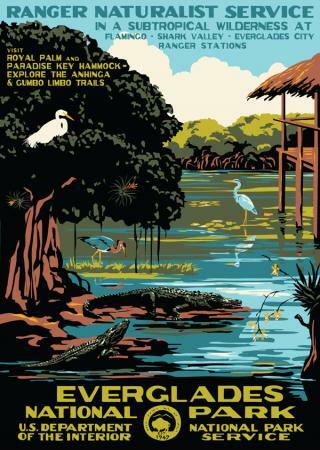 While one might think that here in the digital age the printed poster has become a “lost art,” many of the tourists visiting our own South Florida Everglades National park might love the opportunity to bring back a souvenir poster as a memento of their trip. ~ by "The Chief" on August 24, 2013. Great story, but what a shame that once again Everglades is the only South Florida National Park even mentioned! Biscayne, Big Cypress and Dry Tortugas are all National Parks, and Biscayne (and probably others) is a regular partner woith FIU on scientific research, art collaborations and other events. for South Florida National Park and the others parks that will be mentioned next!